1. Preheat oven to 325°F (160°C). 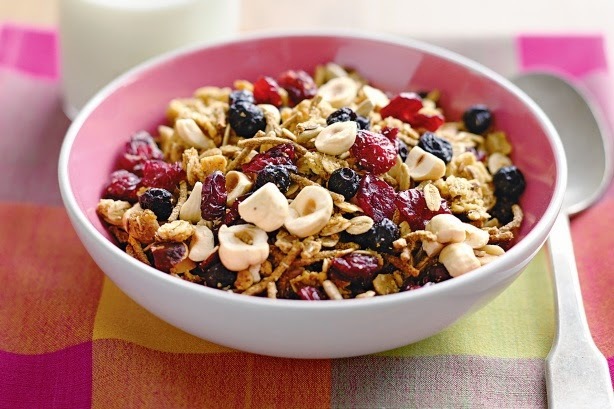 In large bowl, combine oats, wheat germ, millet flakes, almonds, sunflower seeds, sesame seeds, dried berries, and sugar. Stir until well mixed. 2. In measuring cup, whisk together maple syrup, oil, and orange juice. Pour slowly into dry ingredients, stirring until liquid is evenly distributed and coats everything lightly. 3. In nonstick roasting pan, spread out mixture evenly. Bake, stirring every 10 minutes to encourage even browning, for 30 to 40 minutes, or until slightly crisp and lightly brown. 4. Remove roasting pan from oven and leave granola to cool. Store in airtight container up to 2 weeks. Serve with plain yogurt, milk, or fruit juice.